In Hyper Universe players take on the role as powerful "Hypers", unique and iconic characters from fiction and pop culture that duke it out in beat-em-up still brawls with MOBA objectives where teams must battle across a unique map to destroy all the opponent's tower turrets to win the game. 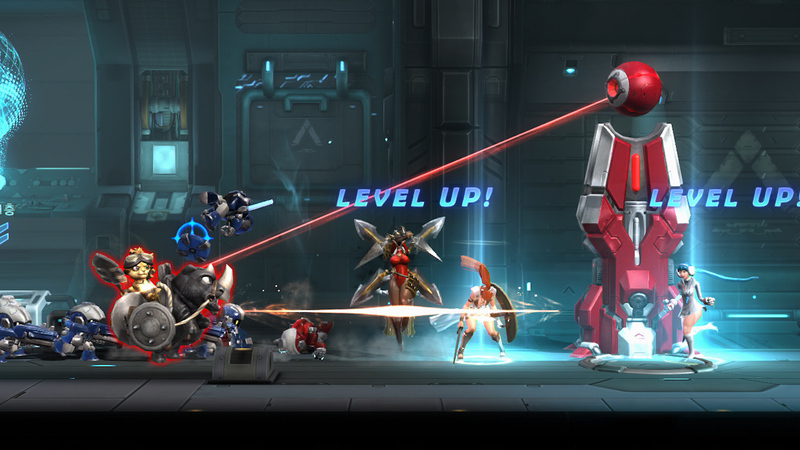 At its core Hyper Universe is a MOBA, players have similar objectives to other MOBA games where they must assist waves of minions to push lanes against enemy towers to soak up shots whilst players unleash massive amounts of damage upon them. The main difference is that the game is a 2D platformer MMO, where in other MOBA teams switch between lanes, in Hyper Universe players switch between levels using ladders or teleporter/jump pads to try and outmanoeuvre and flank their opponents. The primary objective is destroying the enemies’ turrets to win the game. The two teams start at opposing left and right sides of the map where their bases are, the place they will also return to when they die. The map itself has 7 different levels with the middle lanes being dedicated to turrets and where most of the combat happens, and the outer levels being for "jungle camps" and the Bosses; where destroying the camps drops an item that greatly buffs the player. Players can move between the map levels to try and come up behind enemy players that have pushed a lane out too far and get a chance to flank them with a gank. There are currently over twenty different playable "Hypers", the characters that players battle with that are a range of unique characters and a reimagining of popular iconic characters such as the Power Rangers, Samus Aran (from Metroid) and even Bruce Lee. Each character has their own role from bruiser, ranged DPS, tank and others, with unique abilities from damaging to support and utility, with a powerful Ultimate ability that is unlocked once a player reaches level six. Hypers can be customized slightly with a variety of items that they can equip themselves with at the beginning of a match, as players earn gold through last hitting enemies, they can upgrade these items throughout the match making them more powerful. Combat offers a beat-em-up platformer meets Smash Bros. Brawl type mechanic, with the 2D graphics players will jump around the area, switching between levels, and jumping into the fray in huge team fights. Combat is very fast and very fun, with characters able to heal up over time when not in combat it also means they can get back into the battle a lot more frequently so that the action never stops.